A Cambridge, MA, firm working on a design of a molten salt reactor, similar in some ways to work done at Oak Ridge National Laboratory, has received $2.5 million in new funding from Peter Thiel’s Founders Fund. This is the second investment in the firm. The first was for $2 million from FF Science, which is a $1 billion fund to give support to early stage science-based start-ups. The company is currently testing materials for key components of the reactor under a three year R&D agreement with the Department of Nuclear Science at MIT. A survey of entrepreneurial and state sponsored firms working on nuclear technologies by the Third Way, a Washington, DC, think tank, has turned up numerous efforts globally to build a better reactor. However, the study also found that R&D on nuclear energy in the U.S. is tiny by comparison to other countries and getting smaller. The group concluded there is a global nuclear renaissance and that it is moving ahead without the U.S. This may be why firms like Transatomic are going the startup route. Dewan and Massie are undoubtedly aware of the huge challenges they face to get commercial acceptance of a new design. The firm has gotten a lot of media coverage in the start-up business press, but it hasn’t gone to the heads of the two scientists running the show. Here’s a brief list of typical challenges and some highlights from the firm’s white paper on what they are doing to meet them. The reactor will have to complete a design review at the NRC. The NRC’s new reactors organization is primarily focused on light water reactor designs. It’s staff has told prospects for fast reactors, including those involving molten salt, uranium metal, and sodium cooled designs, that it doesn’t even have a complete list of the safety questions it needs to answer to complete a design review. In a major blind spot, neither the NRC, DOE, nor Congress have provided funds to help bring these types of technologies through a verifiable safety review. The reactor will need a construction and operating license. Given that this would be, technically speaking, a first-of-a-kind license, the same kinds of uncertainties would create issues for the NRC and the applicant. Given these constraints it is entirely possible that TransAtomic’s first customer won’t be in the U.S. The ability of an engineering procurement contractor to take the design and build one is a question. For instance, how would the primary loop of hot molten salt work with a conventional steam generator? Alternatively, would the secondary loop simply be run through the primary reactor vessel? There are lots of conceptual ideas. Which one is best? How will you know? According to the white paper on the firm’s website, it has a solution offering a conceptual diagram worked out in collaboration with Burns & Roe. The image is too large to post here. See the link to the white paper. How would TransAtomic prove to a utility that the design could be build on time, within a fixed schedule, and be able to be operated at a profit? Would the first unit, a demonstration platform, be able to provide answers to these questions? According to the white paper, the firm believes there are a range of commercial power plants that can envision using Transatomic Power’s technology. The firm worked with Burns & Roe on a pre-conceptual plant for a 550 MWe (gross generation) TAP reactor, with a net output of 520 MWe. Transatomic says such a plant would serve a gap in the market. Today’s most modern light-water reactors are typically large units aimed at 1000 MWe and above. A recent push to develop small modular reactors (SMRs) is aimed primarily at 300 MWe and below. The 520 MWe size may be particularly attractive to utilities, according to Transatomic, because it is sized similarly to aging coal plants. The firm estimates the overnight cost for an nth-of-a-kind 520 MWe size, including on-line fission product removal and storage, was estimated at $2.0 billion with a 3-year construction schedule. The firm offers on its web site a number of insights into its thinking. Here is a brief summary based on their talking points. Transatomic Power’s advanced molten salt reactor consumes spent nuclear fuel. According to a fact sheet on the firm’s web site, the design solves four of the most pressing problems facing the nuclear industry: ecological stewardship, public safety, non-proliferation, and cost-efficiency. The firm states, “Only an advanced reactor that meets all four goals at once can truly change the game and allow for broad adoption of nuclear power.” A technical white paper gives a more detailed description of the reactor design. Also, Ms. Dewan appears in this 11 minute video on YouTube explaining her work. The reactor can be powered by spent nuclear fuel because it uses radically different technology from conventional plants. Instead of using solid fuel bundles, the reactor dissolve the spent fuel into a molten salt. Suspending the fuel in a liquid allows an operator to keep it in the reactor longer, and therefore capture more of its energy. Conventional nuclear reactors utilize 3% – 5% of the potential fission energy in a given amount of enriched uranium fuel (U235) before it has to be removed from the reactor. Transatomic says its design captures 96% of this remaining energy which is the U238. Molten salt reactors are not a new technology. They were originally developed and tested at the Oak Ridge National Laboratory in the 1950s, 60s, and 70s. In many respects, Transatomic’s reactor is similar to these early designs. These similarities to previous designs allow the firm to build on an established body of research and reduce the uncertainty associated with the design. 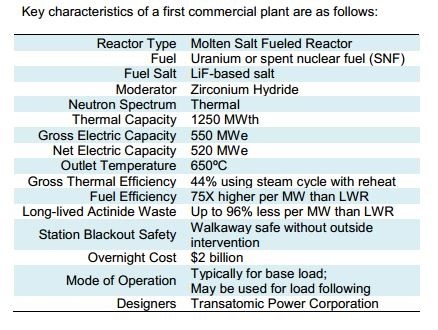 The main differences between Transatomic Power’s molten salt reactor and previous molten salt reactors is a metal hydride moderator and LiF- (Heavy metal) F4 fuel salt. These features make the reactor design more compact and generate electricity at lower cost than other designs. Furthermore, previous molten salt reactors, such as the Oak Ridge Molten Salt Reactor Experiment, used uranium enriched to 33% U-235. Transatomic claims their design can operate using fresh fuel enriched to a minimum of 1.8% U-235, or light water reactor spent fuel. Call me pessimistic, but I simply cannot see a path through the NRC. They would need to develop so many new regulations for this type of design at $275 per reviewer hour (or whatever the current rate is). Terrestrial seems to be the only company that has a chance, simply because they are not dependent on the NRC. Franly, I don’t see that any of the so-called “fast reactor” startups would even consider seeking a safety design review from the NRC. My speculative view is that their first licensing deals for their designs will be in other nations.